1. Accessories. By far the easiest way to work any trend is with accessories. You don't just have to stick to black though. These lace bonnet caps (yes, the type your grandmother used to wear) for £1.50 each at Muslim Base are available in 17 colours. Look out for lace-trimmed clutches and shoes too. 2. For evening wear, layer this black lace shrug (£10, Peacocks) over a long sleeve tee with a silky maxi dress. 3. There are plenty of lace dresses around, but most tend to be far too fitted. This lace tunic dress for £70 at Oasis is just right though. Add a coloured long sleeve tee underneath to brighten up the look. 4. 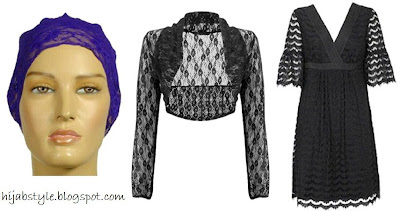 If you're an abaya girl, then this Black Chantilly lace jilbab for £74.99 by Inaya Collection would be perfect. It consists of an outer lace layer over a plain black jilbab. Slip it on over different coloured jilbabs for a more individual look. Love the abaya, I've never seen one in lace before. I did the lace shrug over long-sleeve tee + maxi-dress too on a wedding party once. It's a nice alternative to ready made hijab dresses.